File Name: Andrew D. Meyers of Gary, Indiana. Notes: Gary is just across the Illinois-Indiana border from Chicago, on Lake Michigan. Chicago itself is home to Bullet-Proof, Ghostrider, Hardtop, Heavy Duty, Scoop, Short-Fuze, and Static Line. Sunbow's Footloose wore a darker version of his 1985 outfit, whose primary shade ranged from forest green to olive, with light brown camo spots and a tan backpack and straps. His hair was black in the Sunbow series. 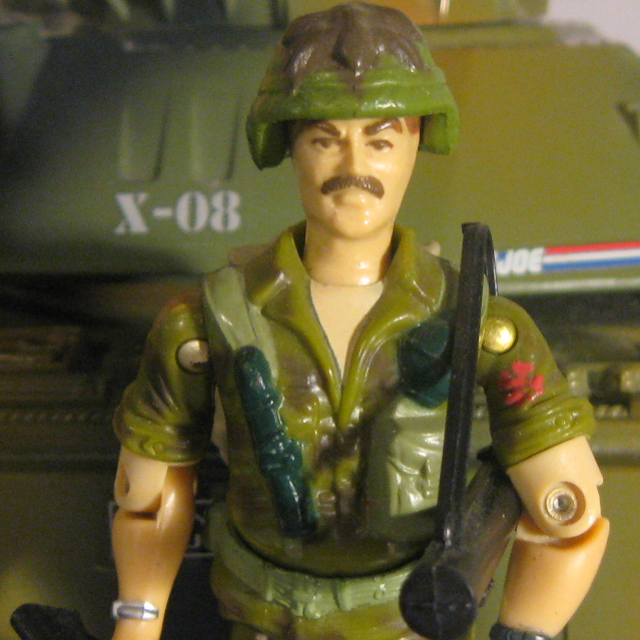 In Operation Dragonfire, he had brown hair and wore a variation on his 1989 outfit: a helmet the same color as the 1985 figure's, a brown shirt with blue grenades and undershirt, black gloves, and green pants with brown camo spots. Accessories: black M16A1 rifle with sling (new), black M72 LAW with sling, smooth on both ends (new), green helmet with engraved brown leaves on top (new), tan backpack with engraved canteen tilted to the left and grenades (new). Meyers was Valedictorian of his high school class, captain of the track team, and an Eagle scout. He was going for his degree in Phys. Ed. on a state scholarship when he suddenly dropped out, moved to the coast, and became quite weird for about three years. He was standing on the boardwalk in Venice pondering something cosmic when the utter pointlessness of his existence hit him between the eyes like a runaway freight train. "I think I'll join the Army," he said, and promptly did. Took basic and AIT at Fort Benning, graduated jump school and desert training unit. Qualified expert all NATO and Warsaw Pact small arms. "Some of the Joes think that Footloose is out there, but all he's trying to do is find himself. He's an All-American Boy who got lost on the way to the fair and he's simply trying to go home any which way he can. Most folks think they know who they are and where they're going... They're the dangerous ones!" Variations: Some copies had darker camouflage than others. Toy Notes: Item #6444. The prototype appearing in commercials had a totally green helmet. Accessories: black rifle (85 Footloose's), black missile launcher (85 Footloose's), black helmet (85 Footloose's), black backpack (85 Footloose's). FOOTLOOSE was the valedictorian of his high school class, captain of the track team, and an Eagle scout. He was going for a degree in Phys. Ed. on a state scholarship when he suddenly dropped out, moved to the west coast, and became quite weird for about three years. He was standing on the boardwalk in Venice pondering something cosmic when the utter pointlessness of his existence hit him between the eyes like a runaway freight train. "I think I'll join the Army," he said, and promptly did. Now, he's an integral part in the G.I. Joe fighting machine! "Some of Footloose's fellow Marauders think he still has a few screws loose. But, when it comes to organizing an attack against Cobra, he's as sane as a general. If we're caught in a 'no-win' situation and the cards are on the table, you can bet the bank the Sarge is going to put Footloose at the head of the patrol to get our tails out of there, fast!" Toy Notes: Item #6560-6. The prototype pictured in the catalog has light green instead of dark green on his lower legs. Accessories: grey rifle (04 Duke's), grey knife (91 Low-Light's), green helmet with black device on brim (04 Rollbar's), black belt (03 Cross Hair's), pea-green backpack (91 Dusty's). FOOTLOOSE was valedictorian of his high school class, captain of the track team, and an Eagle Scout. He was going for his degree in Phys. Ed. on a state scholarship when he suddenly dropped out, moved to the West coast, and spent three years searching for elusive answers to cosmic questions. He was standing on the boardwalk in Venice one day when the randomness of his existence hit him between the eyes like a runaway freight train. "I think I'll join the Army," he said, and did. After completing basic, jump school, and desert training, he joined the G.I. Joe Team. "You can ponder the big questions all day, but in the end, what counts is doing something tangible to make things better."